“I have achieved my life-long goal.” I declared proudly to my son. “You became a grandmother?” he asked. Long-time readers of this column may be aware of my less than ambiguous feelings about the holiday. One of my first articles was titled “Just Say No to Christmas. More recently I wrote “Christmas- Problem or Solution.” It began with a clear statement of my deepest feelings. Over the years, I have blamed this irrational feud on numerous factors – canned supermarket music, blow-up plastic nativity figures, my children, my husband, the fact that I am a skinflint, and the weather. This time of year is cold, dark, and just bad. Every year, I declare that this, this is the year that I won’t let myself get all stressed out. I won’t buy a thousand presents. I won’t make it my responsibility to make sure all my children have the best Christmas ever. “Yeah…since two of them aren’t even going to be here…that would be a good plan.” my husband added. I glared at him. But then it occurred to me. This year I have succeeded. 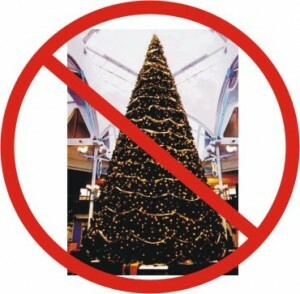 “There will be no Christmas in 2010.” I informed my children. It took a bit of maneuvering on my part. First, I got my husband to agree to a major home renovation. It seemed like a modest, and sensible request this summer. Who knew, that, as a result, one week before Thanksgiving my house would have achieved total chaos? I recall sitting in my living room, calmly sipping a beverage and surfing the Internet, when my son walked in. At the time, the living room held three rooms worth of furniture. My husband is a genius at packing. So, that evening, coffee tables sat on top of coffee tables. Two large wall units spooned in a corner. The couch was piled high with CD’s, bills, blankets, and a spider plant. The dinning room table was jammed against the fireplace, and chairs perched precariously on top of chairs. My beverage was balanced on pile of books that were balanced on a footstool. Still this arrangement posed certain problems for the holidays. “What? Are you saying that we can’t have my relatives over?” I whined plaintively. We shifted Thanksgiving to my daughters house (a brilliant stroke in itself) thinking things might be better before Christmas. I was not ready. My life is busy. I’m working. We’re doing house stuff (ok…my husband is, I’m not) but I’ve developed an on-line scrabble addiction and don’t have time for trivial things. And then, on December 7th, I became a grandmother. The world-changing birth of Abel happened. Who has time for Christmas now. My husband obviously! Since the kids wouldn’t be around for actual Christmas, he had planned ‘Fake-mas’ for the week before Christmas. Even though the house was still a disaster. This is when I had my brilliant stroke of genius. I realized that it was one week before Fake-mas, I hadn’t even thought about it but I could play a trump card. I called my daughter-in-law. So that is the story of how I destroyed Christmas for 2010. Today, I am feeling pretty smug. I haven’t sent cards. I haven’t bought presents. I haven’t decorated. I have no tree. I am the grinch! !